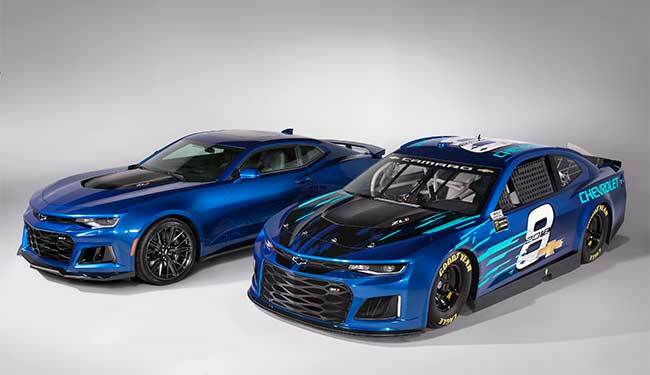 DETROIT — Chevrolet dipped into its rich motorsports history in assembling the race car that will tackle the Monster Energy NASCAR Cup Series in 2018, announcing Thursday that it will bring the Camaro ZL1 name to the sport’s top division. History, in this case, doesn’t mean a relic, not with seven-time series champ Jimmie Johnson’s grand introduction of the freshly race-ready car — a snarling, fast-revving Thursday afternoon rip on Detroit’s East Jefferson Avenue echoing off the towers of General Motors’ Renaissance Center headquarters. The deep-blue car, which will replace the outgoing Chevy SS next year, was adorned with the No. 8, the favored car number of pioneering racer and company founder Louis Chevrolet. It was enough to make longtime Chevy driver Dale Earnhardt Jr. consider his garage-space options back home in North Carolina. Bows toward history were all around as the cars took center stage with drivers, teams, NASCAR officials and eager GM employees, but among the 2018 Camaro’s primary objectives is current-day relevance, in the showroom and on the speedways. The race-prepared version will make its competition debut at Daytona International Speedway in February 2018. The Chevy SS has been a formidable racer, with 71 wins in NASCAR’s premier series, but it has competed without a significant refreshing since its 2013 debut. From a consumer standpoint, the Camaro represents a more visible model than its road-going predecessor. The low-volume SS, a V8-powered four-door sedan based on the Australian-built Holden Commodore, ends its production run this year. “Selfishly, it’s going to be a great race car, but it’s also going to be really good for the dealer business,” said Rick Hendrick, who has dual stakes in the Camaro through his dealership empire and Hendrick Motorsports operation. Earlier Thursday, Hendrick took delivery of the first production Camaro ZL1 1LE at Chevrolet’s Lansing, Michigan, plant. Keeping the road and track relation a strong one was a key part of the race car’s development, said Mark Kent, GM’s Director of Racing. Kent indicated that the street car’s dimensions dovetailed nicely with the required proportions of NASCAR’s current sixth-generation car platform. The similarities were so uncanny, Kent said, that he had to offer periodic reminders during group reviews about which one was the race car. Kent said wind-tunnel testing of the racing Camaro prototype had produced positive aerodynamic data, which drivers were eager to back up in testing and next year’s competition. While performance indicators have stoked optimism within the Chevy camp, the truest test is likely to come in Daytona’s Speedweeks next winter. Once the performance bar is established, what remains are landmarks — the first pole, the first win and the ultimate goal of the first championship. The vying for those “firsts” will add an extra layer to the competition for bragging rights within the automaker’s ranks. Though Earnhardt’s full-time career will be coming to a close before the Camaro ZL1’s racing debut, he said he’ll be watching those contests with interest. “I think that’s something that’s on all the drivers’ minds, to be the guy to get the first win. There’s all kinds of little milestones like that in manufacturing and within your team,” Earnhardt said, noting that the next victory for his Hendrick-owned team will be its 250th.